f you looked through Fashion Pinterest Board you would find so many of my dream outfits paired with a swish pair of sneakers and still I never made the leap. When posting this revelation onto instagram, as I shared one of my first shots wearing my new shoes, I seemed to be quite late in joining this trend. My wardrobe filled with black leather boots, sandals and heels proves I was never one to stray far from the familiar. But what can I say. I'm a convert. When I first spied these babies on the Glue Store website I knew I had to have them. If I was going to give this shoe craze a crack, I was going to jump right in. No cheapo sneakers for me, they had to be perfect, I would have to want to wear them. That was the only way. I went for Vans. "Old Skool Classic Tumble Sneakers" in White Leather. I knew if I went for canvas sneakers they would be dirty in week and I'd never get them clean. I'm not the most graceful person as I walk down the street. Prone to stepping off the gutter into a dirty puddle. To style these shows for the first time I wanted to go back to basics. At first I was looking at a simple but always stylish combination of denim shorts and a simple tee. I knew that was an outfit that wouldn't fail. But I wanted to mix it up a bit. White sneakers seemed to go with almost everything. Ridiculous? There were already too many outfits that I owned where my black shoes just seemed to... well dark for the occasion. 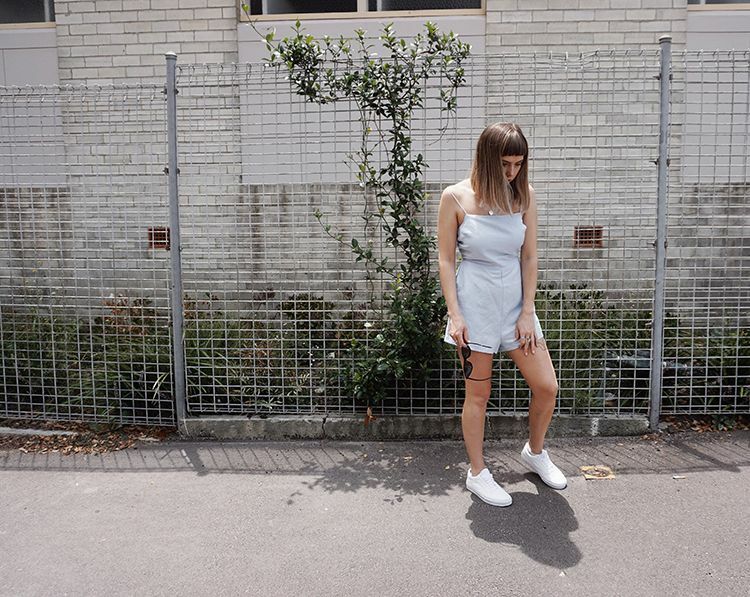 I picked a beautiful baby blue playsuit from Glue Store to go pair with my shoes. The Maaten Playsuit by Interval. Some sizing insight, they were already sold out of the 6 so I went for a size 8 in the romper. While a bit big, the lace up back allows you to pull it in tighter. So it's really not an issue. I'm really happy with how well these two pieces paired together. Honestly I'm only sorry I didn't buy a pair sooner! (what was I doing!!) I almost feel as though the possibilities are endless now when it comes to choosing an outfit for them. Josh will be saying, babe please wear some different shoes for once okay. I went through a similar phase with my dr martens. Also because I planned to wear the heck out of my new sneakers, I bought some Sneaker Protection Spray at the same time. I gave them a good spray and let them dry out before I had even threaded the laces in. Sorry before I had even asked Josh to thread the laces in. But now I feel a lot more confident about them staying white for the near future! Anything with a lace up back in the best! I'm so happy with all of my Glue Store purchases! In case you missed it, here's a link to everything I'm wearing here today! Welcome to the white sneaker life! Haha! You look killer in them, good choice! white shoes is LIFE! welcome to the club and I am sure you will get tons of wear out of them as they look SO good! White sneaks suit you so dang much babe!